A forklift’s most important component is its operator. The FB13-20TCB series is particularly effective in creating the best working conditions for its operators. Electric power steering, great visibility, ergonomic controls, comfortable seat and impressive leg room are just some of the ways this is achieved. The moment you slide into the seat, everything feels right. 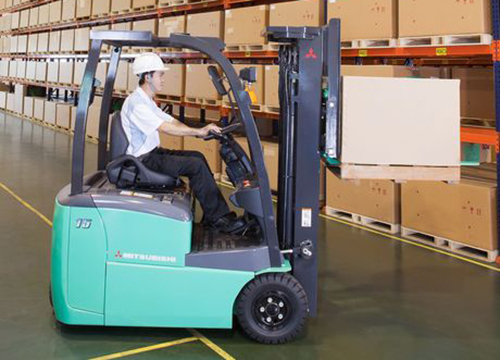 Mitsubishi’s series of 3-wheel electric forklift trucks are ideal for the logistics and warehousing industry, providing clean and robust power with nearly maintenance free operation. With its ultra-compact design and incredible manoeuvrability, the FB- TCB series is unbeatable in confined working areas such as narrow warehouse aisles and containers. Equipped with a 48 volt battery, efficient AC Power traction and hydraulic motors and regenerative systems, it’s the logical choice for all daily operations. While these trucks are perfect for indoor applications where noise, pollutants or particulate contamination is undesirable, they also now come with a higher IPX4 rating, which means the forklift and its systems are protected against water spray from all directions and angles, making them safe to operate in rain. All FB-TCB series forklift trucks are installed with the innovative AC Power control system. It provides for more powerful and more advanced capabilities by integrating travel, hydraulic and electric power steering functions into one cohesive system. The FB-TCB range also comes with an array of safety improvements. An essential feature is its integrated speed control on slopes. On an upslope, if the accelerator or brake pedal is released, the truck will only roll backward at a speed of less than 1 km/h, providing peace of mind for the operator. Furthermore, Mitsubishi’s electric 3-wheeler comes with a standard digital load indicator. 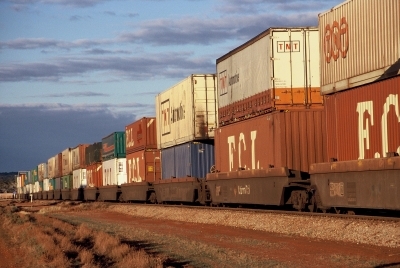 Operators can quickly tell the weight of the load to prevent overloading. When overloaded, the truck will warn the operator through the display and by a warning buzzer. Every feature in the Mitsubishi is designed to help you focus on putting the truck, and the load, safely in precisely the right place. For more information on this product contact MLA Holdings on 131 652 or www.mlaholdings.com.au. Rohlig Australia Deliver Small Parcels too. Will hybrid technology revolutionise the trucking industry?